If you're all about feeling relaxed when it comes to fashion, this combination of an Alexandre Plokhov gathered neck t shirt and light blue ripped denim shorts is totally for you. If you're in search of a casual yet chic outfit, choose an Alexandre Plokhov gathered neck t shirt from farfetch.com and blue skinny jeans. As well as super comfortable, both pieces look incredible when paired together. Bump up the cool of your look by wearing black suede ankle boots. If you're on the hunt for a casual yet seriously chic outfit, reach for an Alexandre Plokhov gathered neck t shirt and black skinny pants. Both garments are very comfy and they will also look great together. Got bored with this ensemble? Enter black suede ankle boots to change things up a bit. If you're after a casual yet incredibly stylish ensemble, dress in a charcoal crew-neck t-shirt and black leather skinny jeans. These two pieces are super comfortable and will look incredible together. 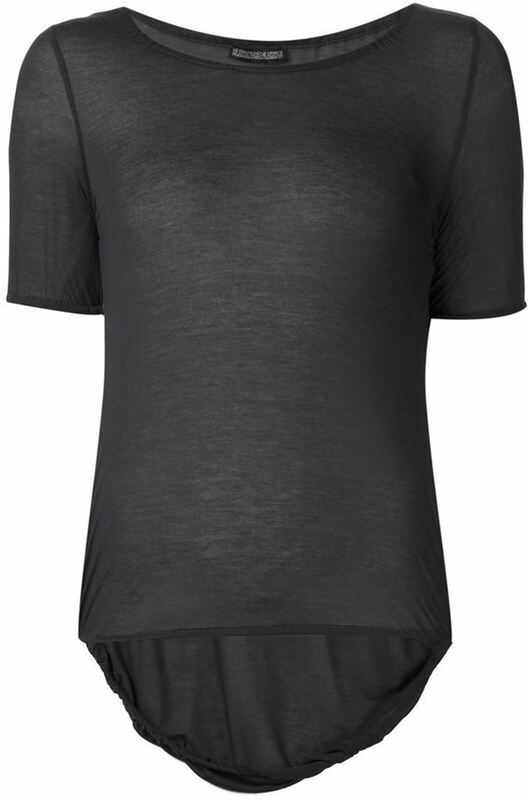 If you're after a casual yet totaly stylish ensemble, make an Alexandre Plokhov gathered neck t shirt from farfetch.com and black skinny jeans your outfit choice. As well as super comfy, these garments look great together. For something more on the daring side to complete this look, choose a pair of black leather gladiator sandals. We're all outfiting for comfort when it comes to dressing up, and this combination of an Alexandre Plokhov gathered neck t shirt from farfetch.com and black ripped skinny jeans is a great example of that. Elevate your getup with black suede loafers. If you're a fan of relaxed dressing when it comes to your personal style, you'll love this super cute combo of an Alexandre Plokhov gathered neck t shirt and a gold skater skirt. Spruce up your ensemble with silver leather pumps. If you're a fan of comfort dressing when it comes to your personal style, you'll love this seriously stylish pairing of an Alexandre Plokhov gathered neck t shirt from farfetch.com and purple chinos. Bring instant interest and excitement to your look with pink loafers. If you're on a mission for a casual yet incredibly stylish getup, rock an Alexandre Plokhov gathered neck t shirt with black leather shorts. Both of these pieces are super comfortable and they will also look great when worn together. Rocking a pair of black leather ankle boots is an easy way to add some flair to your outfit.